Lord Howard de Walden, upon arrival in Lisbon as minister in 1833, leased a house in Lapa, a smart suburb on a steep hill rising up from the Tagus, just west of the city centre. Lapa had been fashionable before the great earthquake of 1755, but its main development came in the rebuilding of Lisbon after the earthquake, and especially during the dictatorship of the Marques de Pombal between 1753 and 1777. 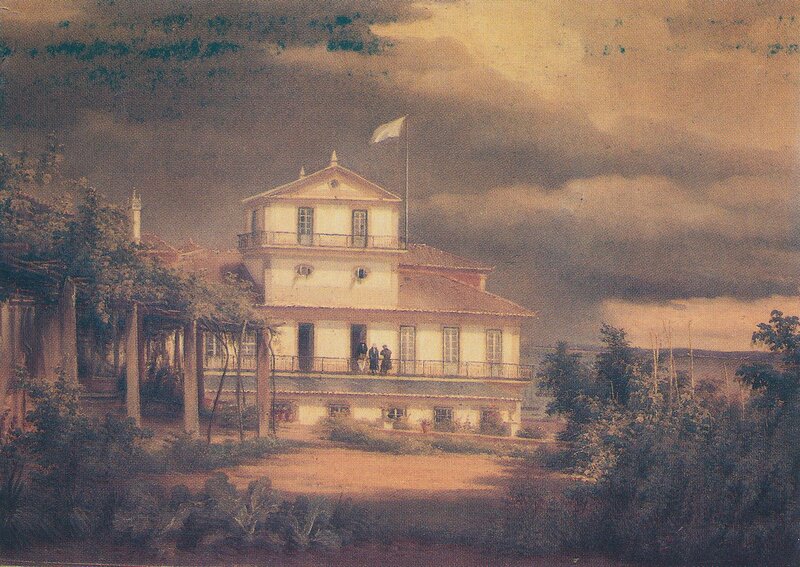 Among the monopolists and bureaucrats who acquired wealth under Pombal was Matias Aires Ramos da Silva d’Eça who bought an estate from the Conde de Redondo and built himself a barraca (wooden house) on the site. It is conjectured that, after his death in 1763, the barraca was bought by the Rio Maior family, who rebuilt on its site a classical Pombaline masonry structure of simplicity and symmetry. This was the house that de Walden leased on Rua de São Francisco de Borja in 1833: some years later, the lease was taken over by the Office of Works, acting on behalf of the Crown. 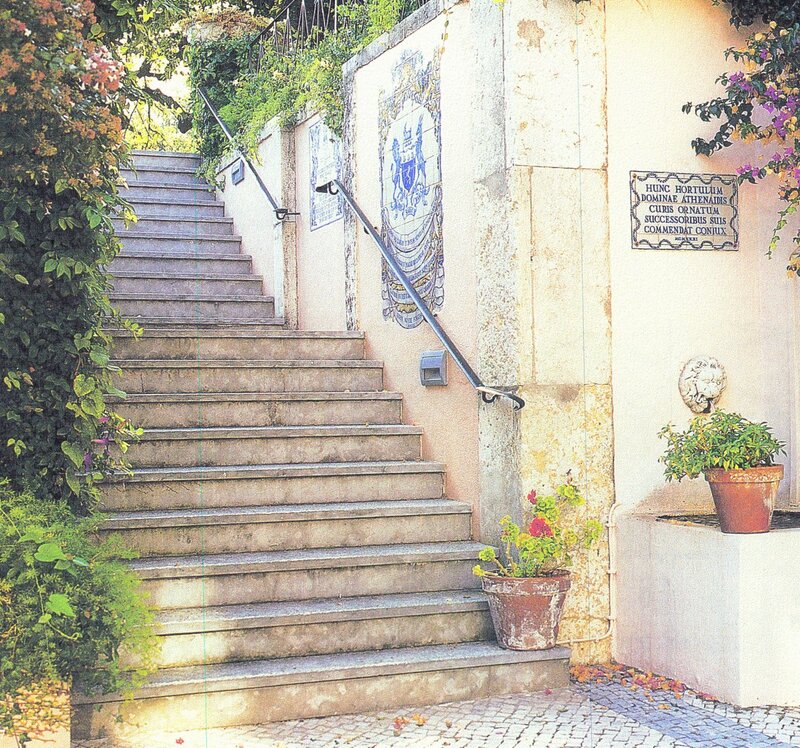 The grounds of the house extended to the west in a strip between Rua do Prior on the north side and Rua do Arriaga on the south, along which massive retaining walls permit the landscaped garden to be roughly level. The Earl of Lytton, when minister in 1874-6, persuaded the British government to buy the property from the heirs of the Visconde de Orta: the sale took place in 1875 and cost £4,927. Lytton quickly extended the ground floor towards the garden with a banqueting room, but it was so badly built that his successor, Sir Robert Morier, took it down and replaced it with the present two-storey wing comprising a ballroom with bedrooms above. The main house was repaired generally at the same time, and again in both 1896 and 1901. Electric wiring and light were introduced in 1908, and the roof replaced in 1924. It was probably around that time that the smoking room was built in the courtyard as an extension to the drawing room. The house leased by de Walden occupied the extreme south-east corner of the site, was nearly rectangular in plan, and of four storeys. The site sloped steeply uphill from south to north to the extent that the coaches housed at pavement level in the lower ground floor at the bottom of Rua de São Francisco were two floors below the level of the service yard at the top of Rua de São Francisco. Rising through this structure, in the middle of its western side, is a four-storey thick-walled rectangular masonry stack of rooms: in the 1929 usages, it housed the dining room on the ground floor, the main bedroom (formerly the billiard room) on the first, two servants’ rooms on the second, and an observatory with wonderful views of Lisbon and the Tagus on the third. It is unclear whether this stack was inherited from the barraca, or was part of the Pombaline design, or was inserted into the Pombaline building after it was completed to provide greater structural stability. In any event, it was certainly in place by 1826, when the artist Baron Antoine-Jean Gros painted the west front while staying in the house with the French ambassador, the tenant at that time. Although the exterior of the house was calm and considered, its internal planning, as a result of the stack and the steepness of the site, was always rather a muddle and never operationally convenient. Among the main difficulties was there being no corridor on the ground or first floors connecting the two staircases; an extremely tortuous route between kitchen and dining room; and a weak connection between the courtyard and the garden. On the other hand, the relationship on the ground floor between all the main reception areas was among the very best of any mission, and they were, at times, excellently furnished, all as befitted Britain’s representation to its oldest ally. The largest of the many azulejos panels and coats of arms that have been mounted on the walls of the courtyard commemorates the 600th anniversary in 1973 of the Anglo-Portuguese Alliance of 1373. As a mission house, from the outset it included a few offices for chancery. The first were on the ground floor, to the right off the vestibule upon entering. In the early 1920s, the former coach house areas, by then garages, on the lower ground floor were converted to chancery offices (and their former space off the vestibule became the visitor’s waiting room): the coaches moved to a building at the far west end of the garden. The status of the mission was raised to an embassy in 1924. As the 1930s advanced, and the unwelcome interest that the Germans and Italians, in particular, were taking in Portugal grew, the pressures on the embassy greatly increased. The offices in consequence invaded ever more of the legation house, and hardly left the ambassador space for his representational role. At the end of 1937, the ambassador, Walford Selby, alerted the Secretary of the Office of Works, Patrick Duff, to the problem, and warned that the offices might need before long to move elsewhere. In 1940, Howard Jones, a senior architect in the Office of Works, was sent to report in detail: he also took it upon himself to propose a way to rationalise the planning of the house so that it could work more efficiently. But the timing was all wrong, and the improvements were never implemented. 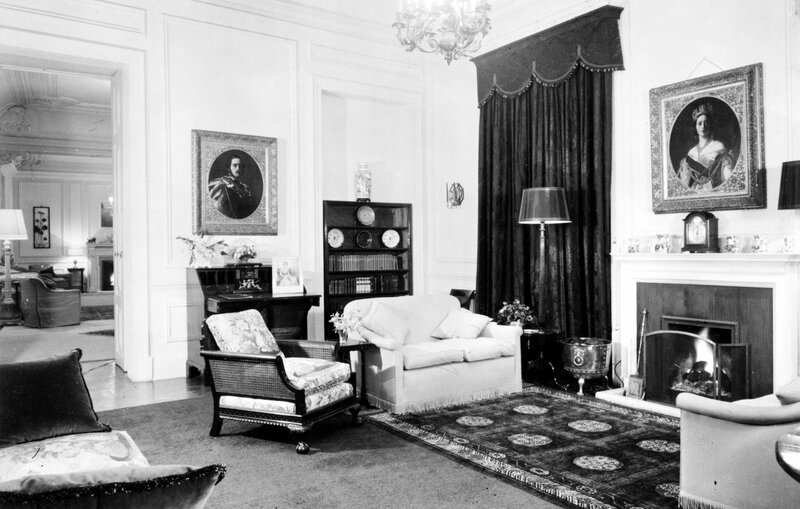 By the end of 1940, alternative office premises had been bought and the mission house began entered its new life as solely the ambassador’s residence. Garden, west, front, painted by Baron Gros, 1826. 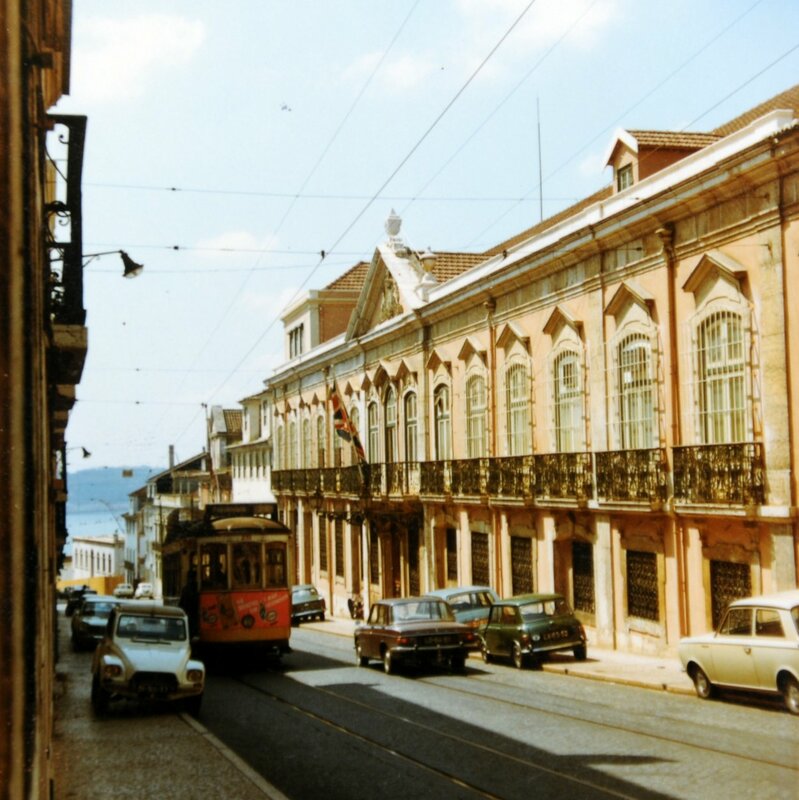 Looking north and uphill Rua de Sao Francisco, with main door on the left, 1954. 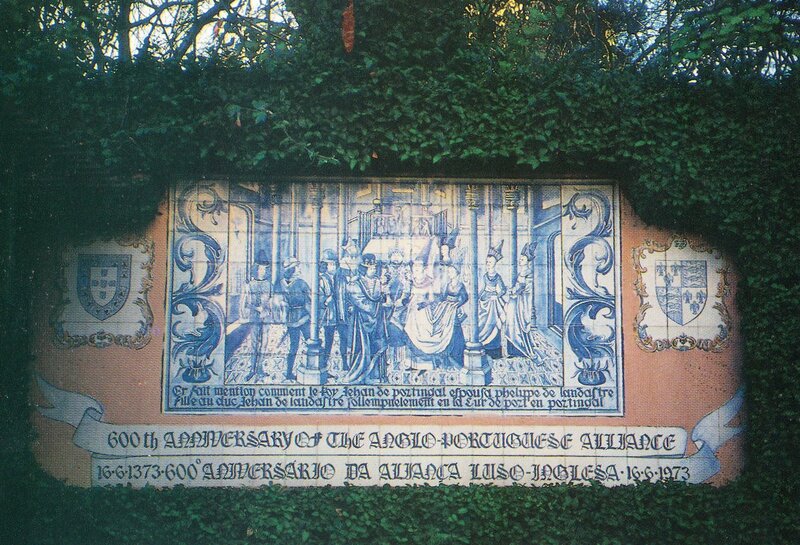 Azulejo panel commemorating 600 years of the Anglo-Poertuguese Alliance, 1973. Proposal for new porch and driveway,by architect Howard Jones, 1940. 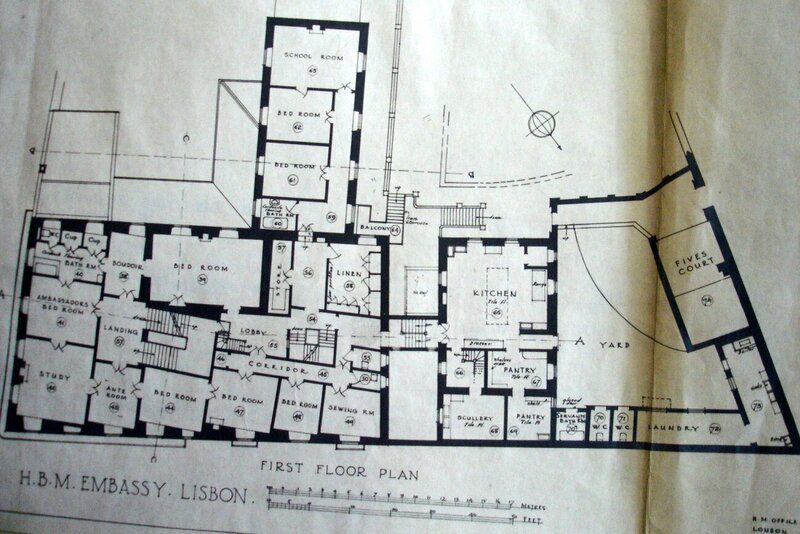 Lower ground floor plan, 1929,with coach house, later chancery, bottom left and residence entrance bottom centre. 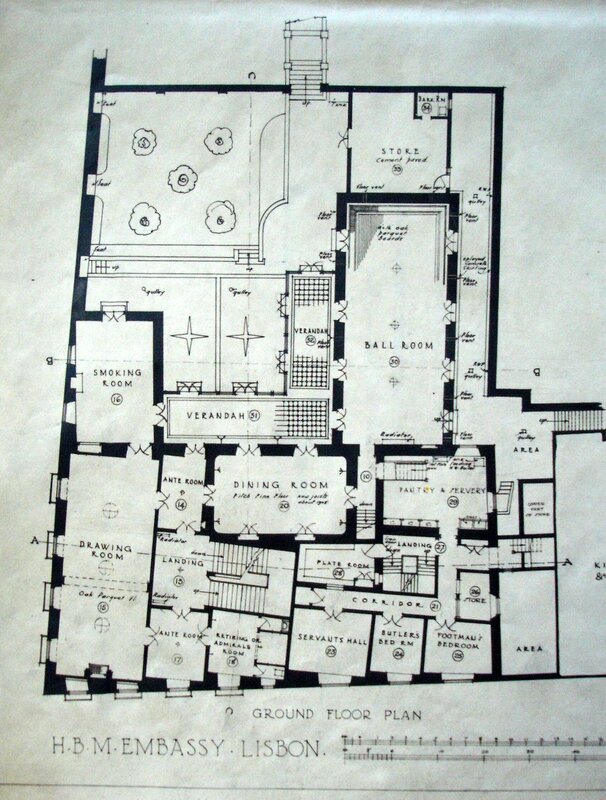 Ground floor plan, 1929, with main reception rooms, courtyard and steps up to the garden. First floor plan, 1929, with main bedrooms and children’s bedrooms and school room in wing above ballroom. The Palácio Porto Covo, at 35-39 Rua de São Domingos in Lapa, only about 250 metres from the mission house, was bought in December 1940 for £29,000 from the liquidators of Porto Covo and Company. (The chapel, at No.41, which originally belonged to the property, was not part of the purchase.) 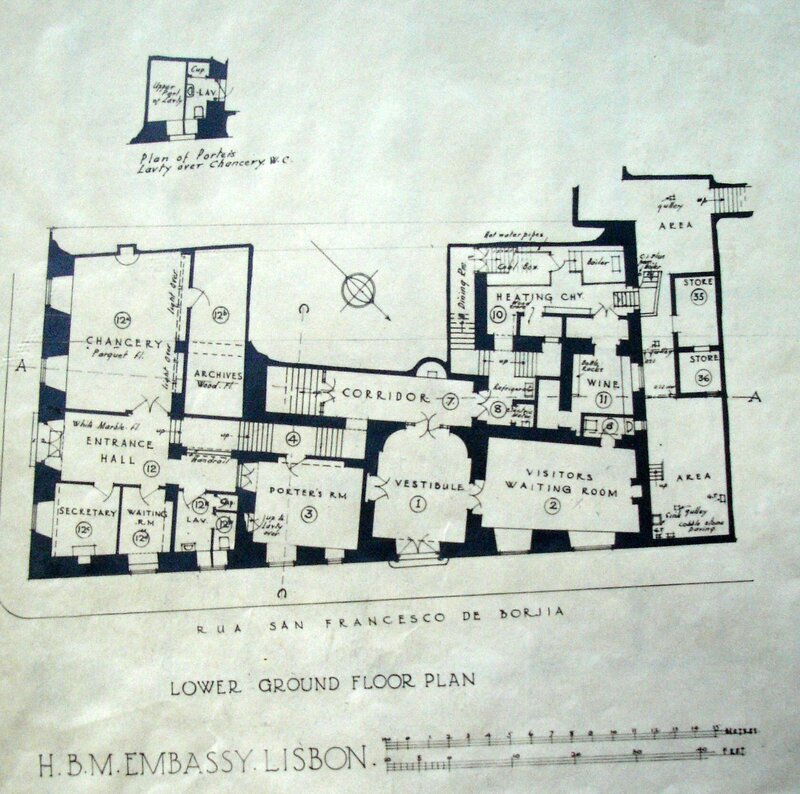 This late-eighteenth century palácio, with a wide, shallow-U plan, four floors of mostly small rooms but an excellent suite of fine rooms and stair in the centre, and giving on to its own large garden, provided a welcome, good and ready solution to the embassy’s office problems. The interior was widely and handsomely decorated with tiles and frescoes. The cottage in the garden was first occupied by chancery guards, and later became the embassy club. The large vegetable garden was re-landscaped, and a swimming pool and tennis court built. A major drawback was the lack of any parking area but, later, some vacant land nearby was leased as a parking lot. The palácio’s worst moment came in 1955 when the Foreign Office’s Information Policy Department instructed chancery staff to destroy a number of old propaganda cine-films. The first batch, burnt in the garden, caused too much noise and smoke, so staff mistakenly resorted to the incinerator. About 30 films were burnt in an hour but the heat set a chimney ablaze and serious damage was caused to the top floor and roof. By 1970, thoughts were turning to either spending a good deal of money on refurbishing the building or moving to somewhere more modern, cheaper to run and maintain, and, given the tram noise in the steep street, quieter. Successive FCO inspectors recommended a move but there was little suitable alternative property available. The Ministry of Public Building and Works put forward in 1971 a proposal to redevelop the 63 Rua de São Francisco de Borja site with a replaced residence and a new offices building at the western end of the garden. That idea made no progress at all. Various attempts were made during the 1980s to obtain permission for a small office building (including a new consulate designed by Trevor Dannatt and Partners) at that end of the residence garden but all foundered on local opposition. 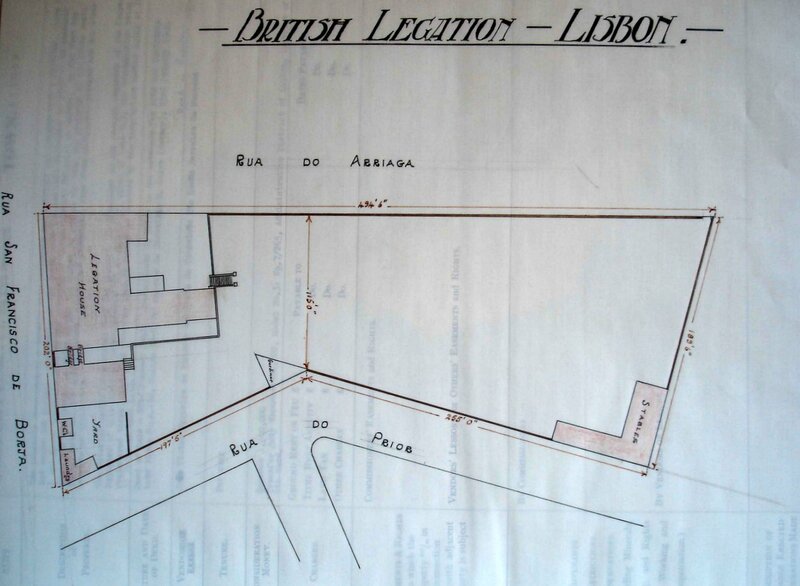 In 1990, the FCO bought for just over £1 million 29-33 Rua de São Domingos, the adjoining downhill properties, as an extension to the offices and for staff accommodation, and commissioned from Building Design Partnership a thorough condition report of all the 29-39 Rua de São Domingos buildings. This was followed by a feasibility study of several options in 1991 which led to a limited [?] refurbishment in the mid-1990s. To cope with the most immediate problem of how better to house the consular offices, the vacant Parsonage on Rua da Estrela was leased for five years from late-1990, and ingoings hastily carried out. 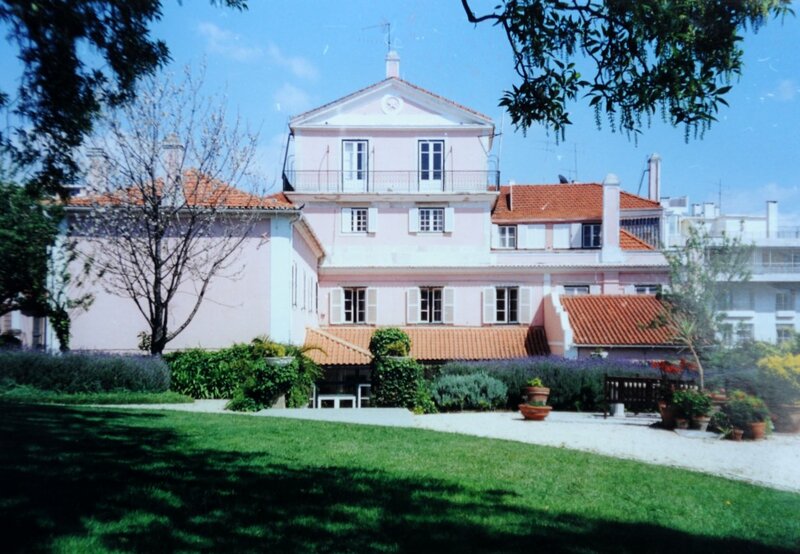 With the property market in Lisbon becoming gradually less constrained, and with very heavy expenditure looming at both its late 18th century Lisbon palácios, the FCO concluded in 1992 that one of them had to go. The choice fell on the offices, and a search for alternative office accommodation began. The search ended with the purchase, in 1994 for £4.15 million, of a 19th century palacette at 33 Rua de Sao Bernado. It was in the course of extensive rebuilding, except for its ornate tile facades and main reception areas, but including two levels of underground parking beneath a garden at the rear. 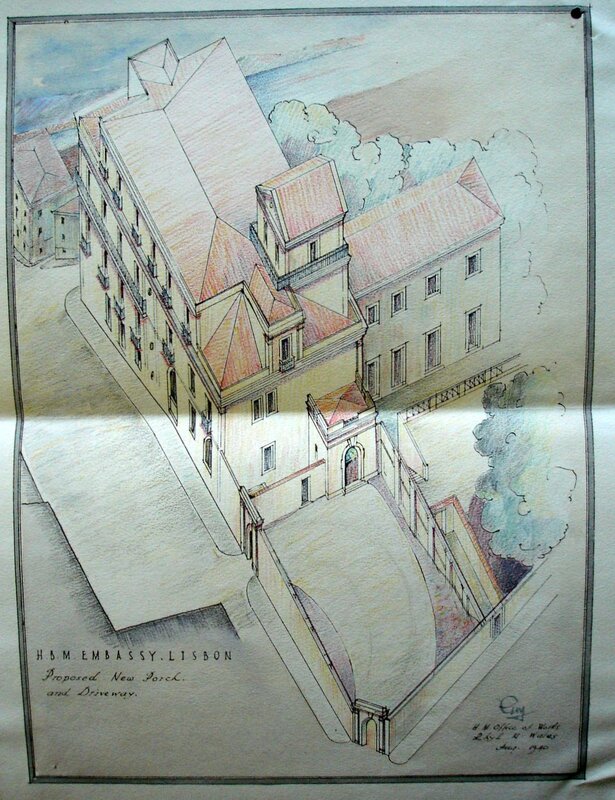 There was opportunity for the contract to be finished off, by in-house architect David Nicholson, with the embassy’s particular planning requirements. The embassy thus re-located in October 1995. The Rua de São Domingos offices were sold two months later for Esc 730million [?££]. The purchaser was Lusitania Companhia de Seguros, a huge medical insurance company, which could afford to restore and look after the building significantly more generously than could the British taxpayer. Their restoration of it was a great success. 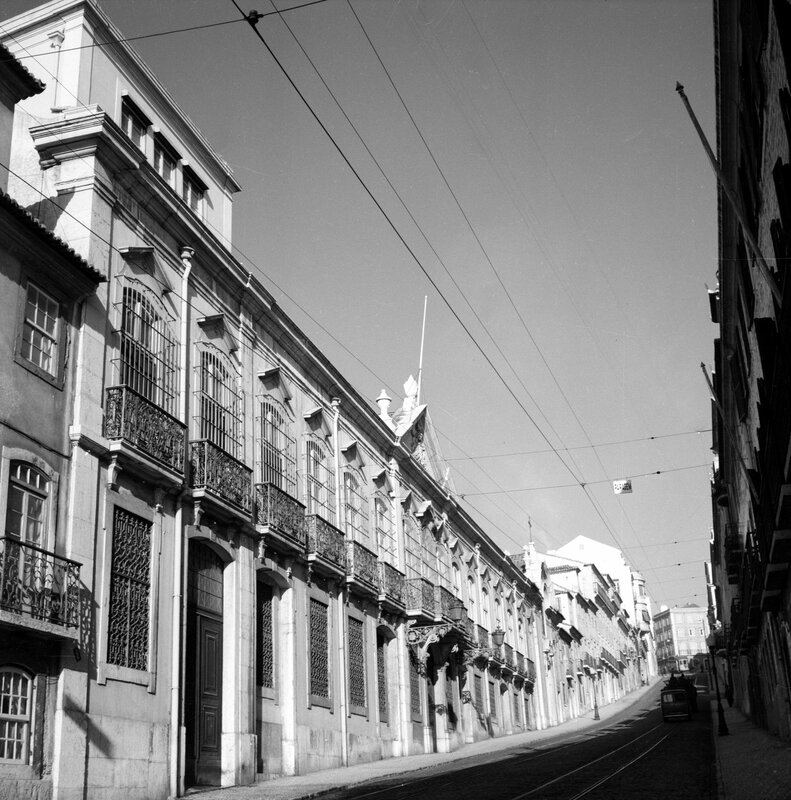 The offices on Rua de Sao Domingos, 1953. 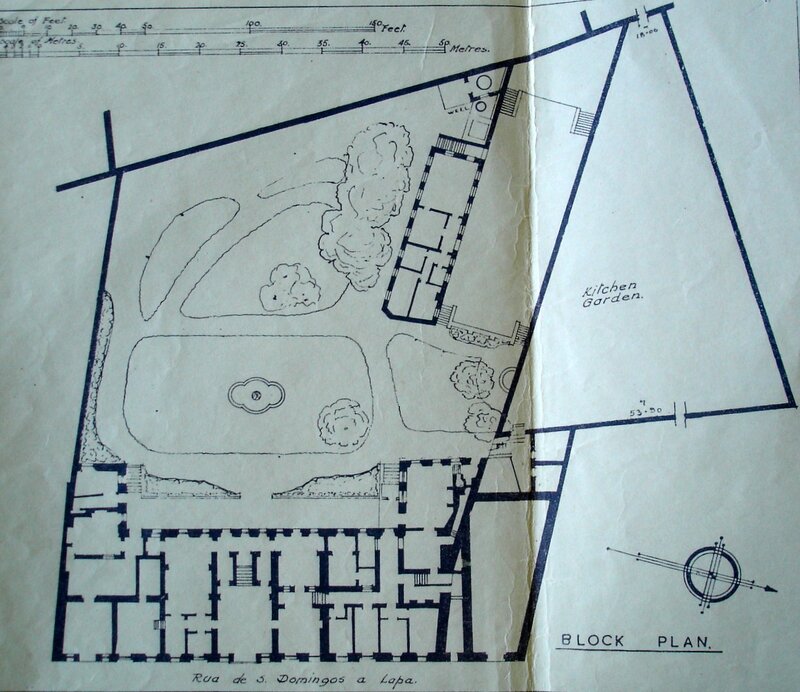 Siteplan of offices and garden, 1947. 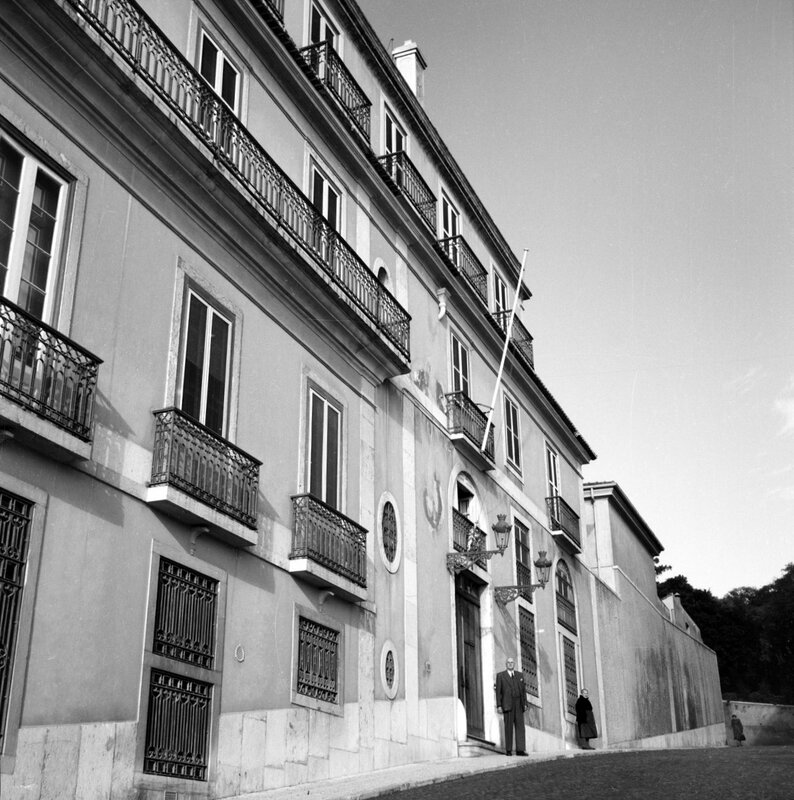 With the departure of the offices in 1940, 63 Rua de São Francisco de Borja took on a quieter role as the residence. Its main rooms continued to work well, and it was always a popular residence to occupy and to visit, but it had no real need for much of its surplus space which tended to fall into disrepair, with unfortunate effects on other maintenance issues and costs. An architect from London recommended in 1970 demolishing the 1870s ballroom wing, which would have both saved money and restored the original design of the house. Genteel decay set in: although, for the most part, it looked in good condition, it was not. There was extensive rot and beetle infestation, and a part of the building was being propped. The idea of removing the rear wing was again raised and discarded. A London firm of architects, Norman and Dawbarn, were commissioned in 1995 to carry out a comprehensive condition survey. The necessary works were expected to take a couple of years, require the outhousing of the ambassador, and cost about £2.5 million. The FCO reaffirmed in 2001 its decision to keep the residence, and to assist the refurbishment costs by selling a part of the grounds. Dame Glynne Evans, ambassador 2001-4, rose to the challenge, and in 2003 moved into an alternative residence that had been found, leased and made acceptable. 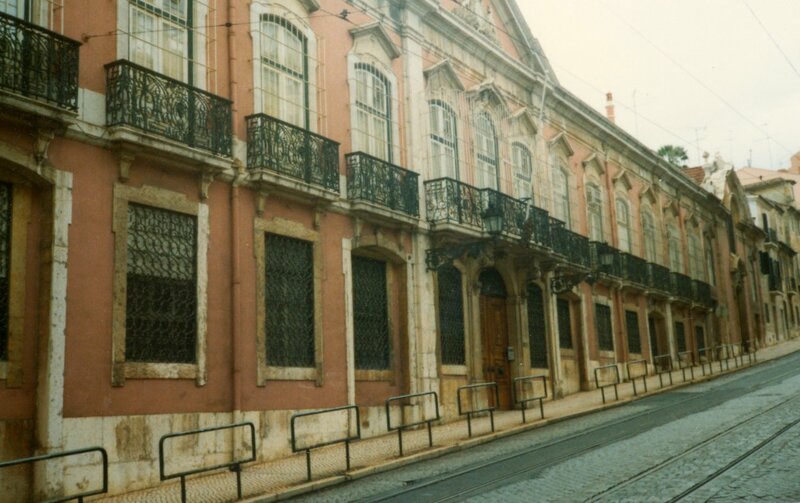 Since the new residence was proving better than expected, and the costs of refurbishing 63 Rua de São Francisco de Borja were increasing, and the FCO was under increasing financial pressures, it gradually became clear that the better course would be to sell and not to restore the Lapa residence. It was marketed in December 2006 as a ‘prime residential development opportunity’ and sold in 2007 for [?] to [?]. It was converted into a range of splendid apartments and several small buildings in the garden. Instead of moving the collection of historical azulejos to another site, a clause in the purchase/sale contract specifically provided that interested visitors would be able to arrange to see them in situ in the courtyard. 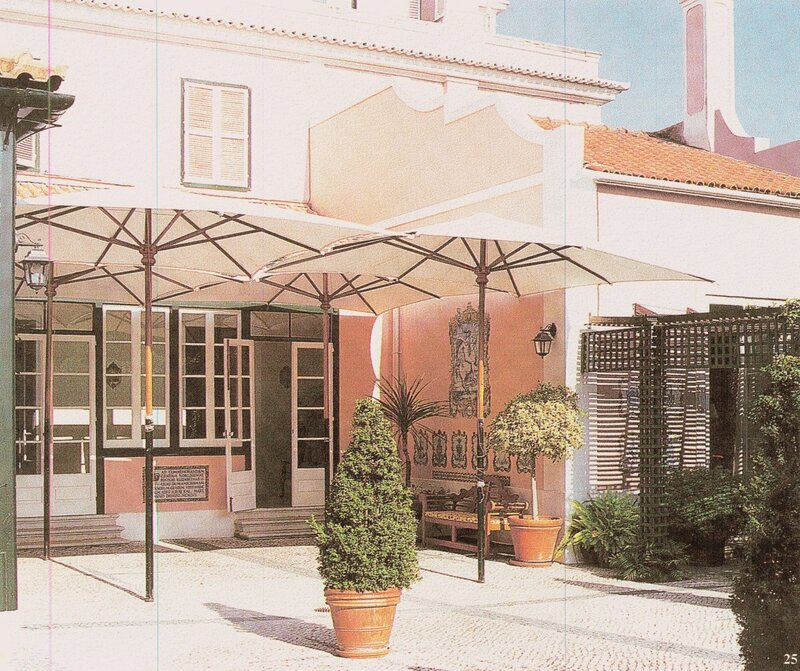 The Residence of the British Ambassador at Lisbon by TA Bull, illustrated by John Coates and published by The British Historical Society of Portugal in 1995 is an accomplished and interesting account of the life of 63 Rua de São Francisco de Borja. Its Appendix B describes the heraldry represented in the azulejos. Part of the courtyard, with azulejo panels and coats of arms, 1990s. Stair from courtyard to garden, 1990s. 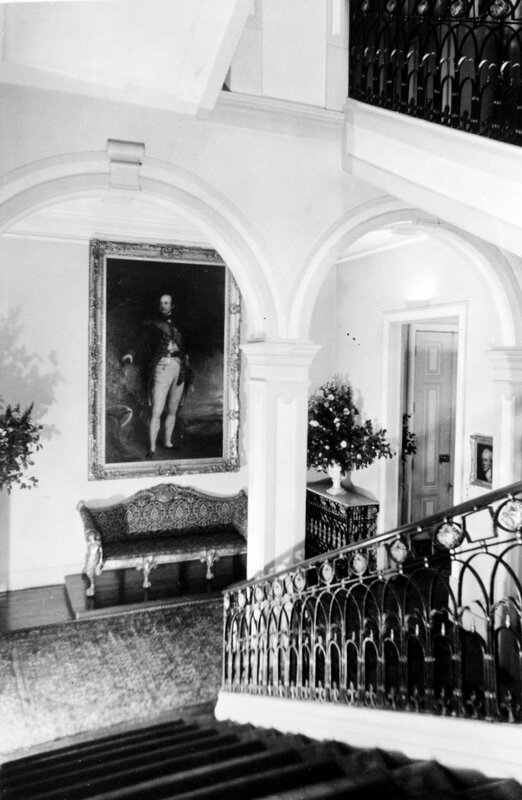 Main stair, with Gen Sir William Beresford on the landing, 1973. 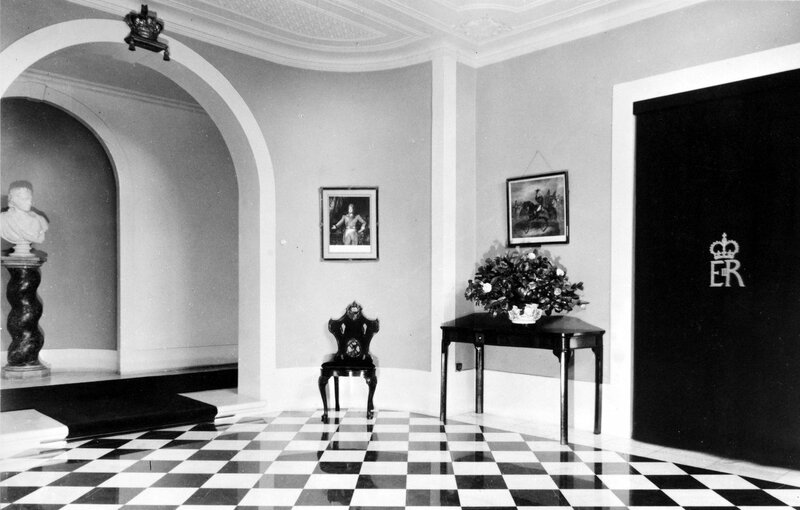 Smoking room with drawing room beyond, 1973.